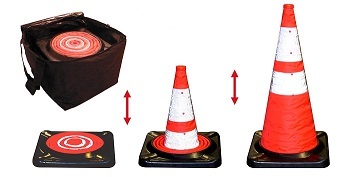 Set of five 28-inch tall Highly Compact Collapsible Traffic Cones with durable Black rubber 8-pound base and reflective prismatic White 4- and 6-inch collars. Cone is made of water-resistant nylon and high-visibility Orange. Set of five cones comes with storage bag with zipper top and convenient carry straps, with case a compact 16x12x17. (Four or fewer cones do not come with carry bag). Perfect for incident first-responders, and in police squad cars, where space is limited. The federal MUTCD recommends a five-cone set. However, they also may be purchased in smaller 4- or 3-cone sets as well for economy.